About five months ago, I wrote an article called Dawn of the (U.S.) cargo bike revolution. At the time, the title seemed like a pretty big leap. 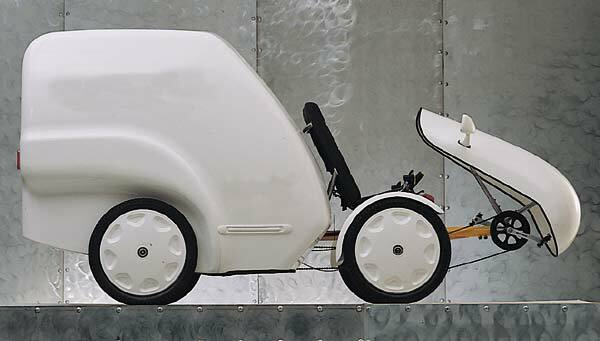 I was extrapolating a new market and mode of transportation based on two barely-available cargo bikes with electric motor options. 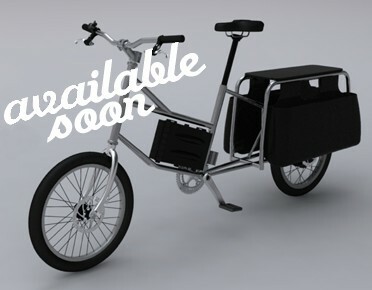 Onya Cycles is a San Francisco-based company with three different electric cargo bikes in the works. They are the brainchildren of inventor Saul Griffith, who won the MacArthur “Genius” award for a variety of projects he has initiated. Saul owned several cargo bikes and wanted to try his hand at correcting deficiencies he saw in each. His innovations range from the somewhat incremental to the fairly radical – definitely worth a mention here. Onya’s “Mule” cycle won’t surprise regular readers of my blog. Like most of the bikes I’ve reviewed during the past year, it’s a longtail. However, it is the first assisted longtail available prebuilt from a manufacturer that adheres to the Xtracycle standard, which opens the door for Xtracycle-compatible accessories (rather than locking into accessories provided by the bike’s manufacturer). 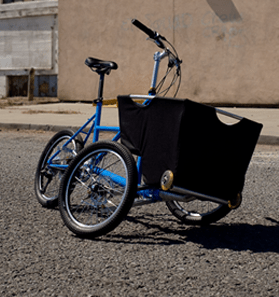 There are arguments on both sides whether Xtracycle standardization is a good thing, but it makes a lot of sense for a smaller company like Onya to leverage the standard. The target price of around $3000 (powered) is high compared to the competition, but if you’ve got hills, the heavy-duty brakes and motor might justify the premium price. 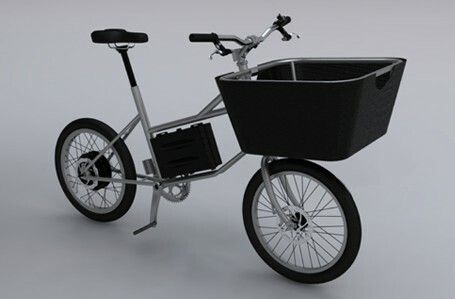 The “E.T.” cargo bike is an interesting new shape (at least, new for the U.S.) for transporting lighter loads (less than 50 pounds) with a more compact bike. With a normal-length wheel base, this might fit on standard bike racks if the front bucket doesn’t get in the way. Target release for both the Mule and the E.T. is early in 2012. If you want to see lots of hills and turns, here’s another video with pretty much nothing but that. The Front End Loader is closer to release than the other two bikes. Onya has already sold 10 beta test Loaders for $4200 each. They realize that price is high, and hope to reduce it as they increase production volume. The videos show the bike climbing significant hills with little or no pedaling. I watched that with a mixture of excitement, dread, and even a bit of skepticism. I’m excited because this was almost exactly my wish when I daydreamed about a perfect bike for my friends and neighbors last May. I asserted that people of all ages and abilities needed to be able to ride up a hill at a decent pace in order to make cargo bikes practical for a broad audience. Maybe that day is close at hand. A tricycle addresses concerns about balance at low speeds. However, I’m concerned that first-time bikers may hop on bikes with this kind of power and exceed their skill levels. A few unfortunate accidents could give the nascent market a black eye, and it might even produce legislation that could curtail the use of these bikes. I’ll have more to say on that later. Finally, I’m a little skeptical because riding a bike up a hill at the claimed speed requires enormous amounts of power. I have questions about the battery’s ability to sustain that, and the motor’s ability to handle the heat that is generated. I’m hoping these are issues that a MacArthur genius can solve. Regardless of how these bikes turn out, Onya Cycles is interesting in another respect. 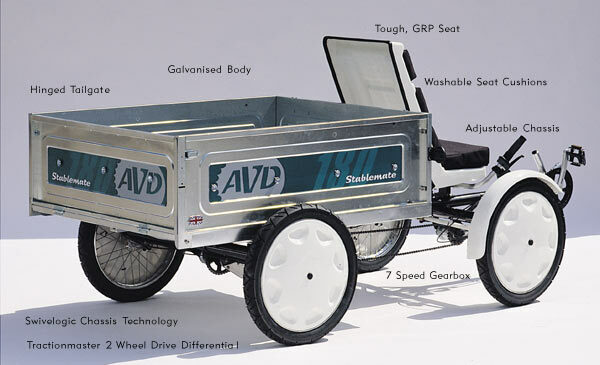 Like Urban Arrow, this is a company whose sole products are cargo bikes (and primarily electric). These companies represent a bold bet that the electric cargo biking market is here to stay. Unlike Trek and Kona, they don’t have traditional bikes to fall back on if interest in cargo biking stumbles. I am further encouraged that these companies are not making a bunch of “me too” products. At this point, each of the bikes I’ve mentioned in this blog might address a fairly small niche. But taken together, they cover a pretty broad range of riders and uses. We’re not growing a mono-culture crop here. Just as biodiversity indicates a healthy ecosystem, a variety of cargo biking designs bodes well for the health of this kind of transportation. But where can you drive them? I’ve been trying to figure out how they fit into the vehicle code of my state. There are regulations pertaining to medium-speed electric vehicles (speed limited to 45 mph), and there are rules for electric bicycles. 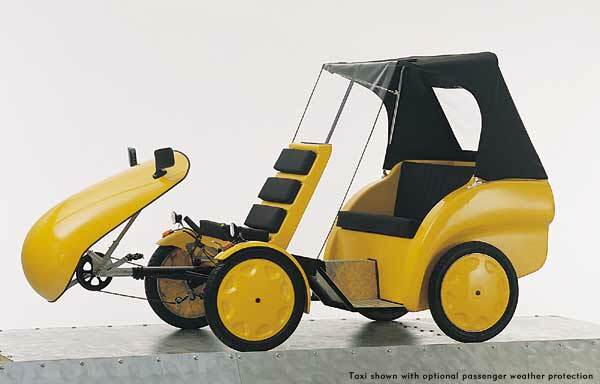 But I’m left scratching my head: where could I legally drive a quadricycle? In the bike lane? Probably won’t fit. On the road with car traffic? That would be an annoying obstacle for drivers on some of our faster roads, even with electric assistance. Perhaps these vehicles are really only useful in big cities, although there are plenty of opportunities there. After our year of living in Copenhagen, it’s easy to see how far the physical infrastructure in most American cities needs to evolve to support lower-speed and lower-energy transportation choices. The legal infrastructure pertaining to electric bikes also needs to evolve – that became increasingly clear as I perused the Washington State Vehicle Code. Different statutes from state to state and country to country impede progress. On the other hand, I fear that regulations developed in the absence of a real understanding of these vehicles will go overboard and unreasonably restrict them. For example, I have a friend who does a good job of tracking biking trails on his blog and trail network website. He alerted me to a recent ruling that restricts use of electric bikes on a trail near Aspen, Colorado. The bewildering varieties and capabilities of different bikes and motors stumped officials until they made it easy: no electric assistance allowed, period. Although that regulation may be revisited, similar motions will be considered in many town councils and state legislatures. To maintain our freedom of mobility, we need to play a part in these discussions. The situation that concerns me most is transport of children. That is a uniquely emotional issue that biking critics will use to restrict cargo bikes on the grounds of safety. If I weren’t allowed to transport my kids by bike, at least half my bike trips would be eliminated, and it would then be difficult to justify the cost of my “car replacement bike.” Cargo bikes will eventually reach a critical mass, and there will be a significant outcry if their use is unreasonably curtailed. But at this point, I feel the industry is vulnerable to restrictions that might appear as reasonable compromises to non-bikers. To avoid any sort of legal backlash, I believe we need to help the public understand the benefits and the realities of cargo biking. Sometimes advocates of a greener life style get a little too enthusiastic and the public gets over-hyped impressions of cargo bikes. For example, in the following video, a helmetless rider carries two kids (at least they have helmets) on a bike that the motor propels at “up to 30 mph” (well over the federal legal limit). Can you blame people for becoming alarmed when they see that? Although I may be alone in this, I also think cargo biking will receive long-term benefits if we are careful to follow traffic laws – even the ones that don’t seem to take electric cargo bikes into account (read BikeForth.org’s counterargument here). If we flaunt the laws we don’t like and annoy 99.9% of the people with whom we share the road, we will have few friends to defend us when laws begin to restrict what/where/how we ride. I realize this advice goes against a cargo biker’s natural inclinations towards non-conformity, but if I can help my community embrace a slower-speed, greener, more sociable lifestyle, living within the rules is a small price to pay.